The suspenseful episode will feature the Five-0 on a mission to rescue main character Chin who was kidnapped. At the same time, Grover—another member of the Five-0—will be undercover posing as a car salesman in order to investigate a murder. Reed will be acting as a car dealership manager. Bills fans, be sure to tune in and show Reed your support! He’s a former fourth-round pick and Division II college player, and all he did was make seven Pro Bowls, win four AFC titles and get inducted into the Pro Football Hall of Fame. Reed, who made an appearance recently on a Tampa radio station (WDAE) offered some advice to the prospects who will essentially be starting their pro careers tonight. It’s been almost a full calendar year since his Pro Football Hall of Fame induction, and life has has changed for Bills all-time leading receiver Andre Reed. He recently explained how things are a bit different. Reed, who will be serving as a coaching intern with the Bills at training camp this summer, just had a park and street named after him in his hometown of Allentown, PA.
We’ve heard Bills head coach Rex Ryan say more than once that they feel they’ve improved their roster to better compete with seemingly perennial AFC East champ and defending Super Bowl champ New England. Bills Hall of Famer Andre Reed took it a step further. In an interview with Talk of Fame Sports, Reed said with their influx of offensive talent the past few weeks the Bills have the horses to give the Patriots a run for their money. Reed did admit that quarterback is still a question mark and the ‘X’ factor for New England with Tom Brady, but Buffalo’s all-time leading receiver believes the Bills have closed the gap. “Right now, the AFC … everybody … is making themselves better, and the Bills have definitely made themselves better with McCoy being in the backfield and Rex Ryan being the head of everything. I’m really excited about this year,” Reed said. 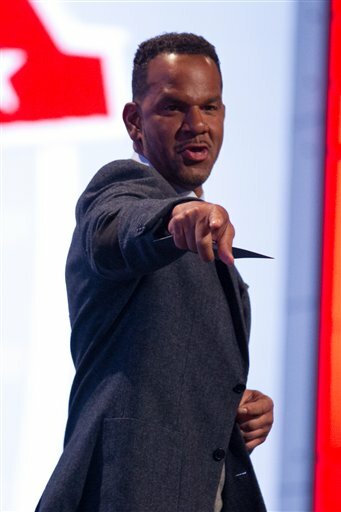 Bills Hall of Famer Andre Reed appeared as a guest on NFL Network’s NFL AM show Tuesday. He was asked to weigh in on Buffalo’s quarterback situation. Unlike most he’s not assuming that recent acquisition Matt Cassel will be the starting QB come September. “There’s going to be a quarterback competition,” Reed said. “They’ve got Matt Cassel now and they brought Tyrod Taylor in from the Ravens. There’s going to be three guys competing and Rex won’t make a decision until probably the first game. Bills Hall of Famer Andre Reed will be receiving a pretty important honor today at his alma mater, Kutztown State. Kutztown University’s stadium, currently known as University Field, will be named in honor of the Golden Bear alumnus in a ceremony prior to the team’s 1 p.m. game today. 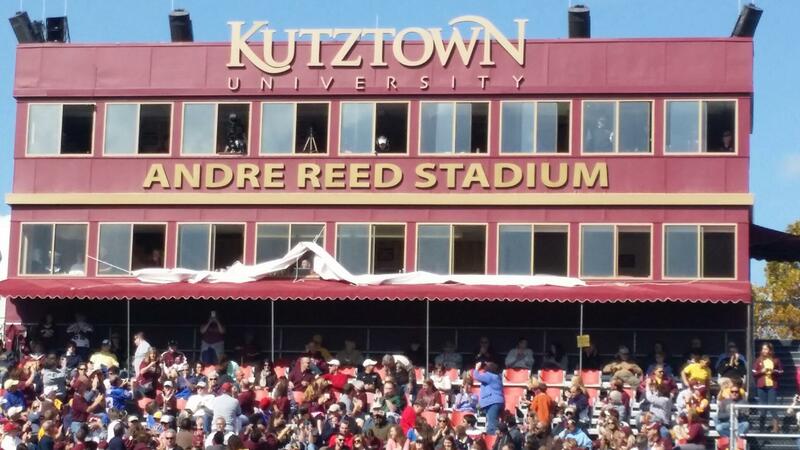 The Kutztown University Council of Trustees approved the name Andre Reed Stadium at a meeting last month. Reed will be on hand for the festivities prior to the game. 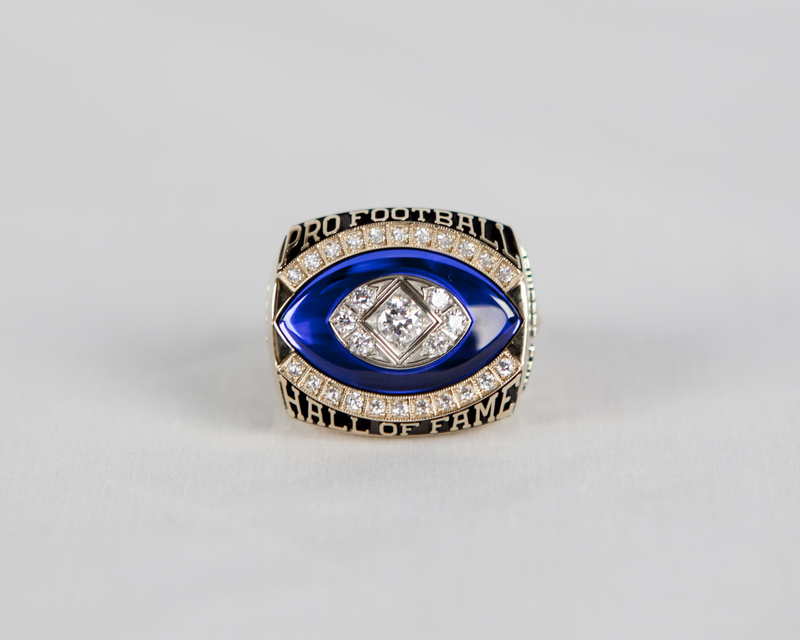 During a special halftime ceremony, Andre Reed will receive his Hall of Fame Ring of Excellence from Hall of Fame President David Baker. 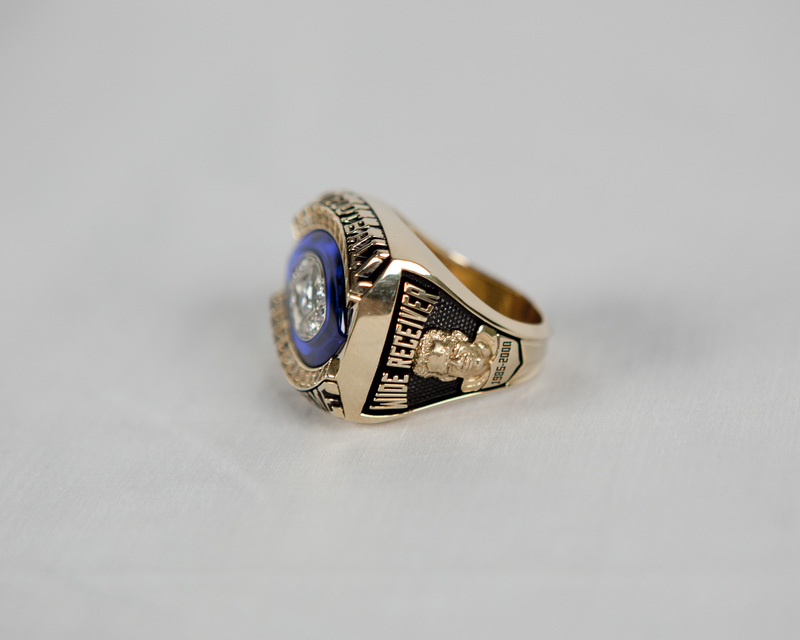 The Ring of Excellence joints the Gold Jacket and Bronzed Bust as the last of the three iconic symbols that represent the elite status of being a member of the Pro Football Hall of Fame. Learn more. 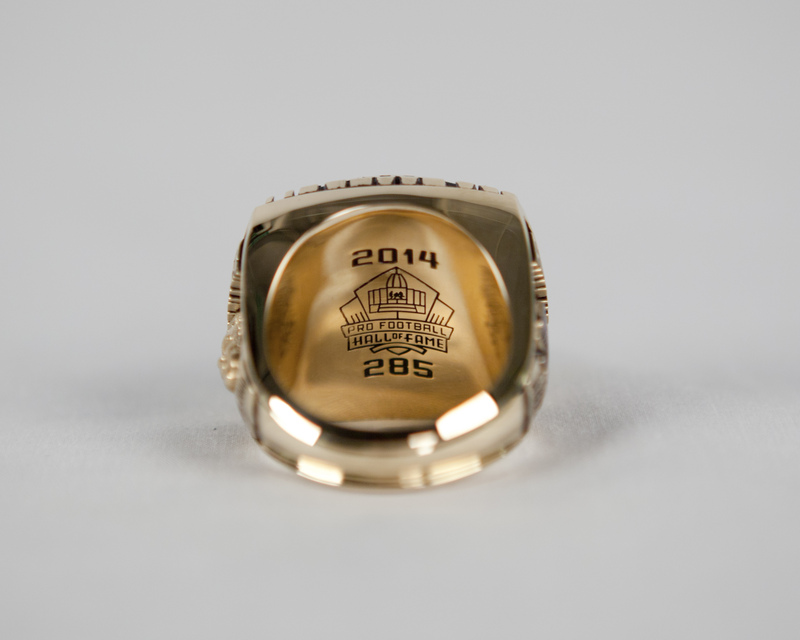 Here’s a closer look at Andre Reed’s ring. “I am excited, proud, and honored for my Hall of Fame ring presentation this weekend. Where else would you rather be … but in Buffalo with my family, friends and fans of the 2-0, division-leading Buffalo Bills. Buffalo is my second home; I am here with my teammates in my Gold Jacket at Ralph Wilson Stadium. I could never have dreamed this moment would come in my life, yet here we are. I love you all, you have my heart and my soul Buffalo, and with this ring we head into the Hall of Fame for life together. Let’s do this, Buffalo, feed off the great energy around this organization. Go beat the Chargers and thank you all for keeping the Bills where they belong. Here’s a rundown of gameday activities for Sunday’s week 3 game against the San Diego Chargers. Gameday Experience: ADPRO Sports Training Center Fieldhouse open 9:30 a.m.
Visa Deal of the Game: $5 Buffalo Bills “End Zone Bears”! Bills Hall of Fame QB Jim Kelly, who is busy fighting sinus cancer, committed to attending Andre Reed’s Hall of Fame induction ceremony. On Sunday night he’ll also flip the coin at the Bills preseason opener in the Hall of Fame game against the Giants, with fellow Hall of Famer Harry Carson alongside him. Kelly was inducted into the Pro Football Hall of Fame in 2002. With four Hall of Fame teammates in James Lofton, Jim Kelly, Bruce Smith and Thurman Thomas and a Hall of Fame coach presenting him in Marv Levy, Saturday night’s enshrinement ceremony is going to have everything Andre Reed could ask for. But Reed’s teammates were more than teammates. They were more than friends and that relationship continues today. “It’s like your own family being there,” said Reed. “You guys know over the years that’s what we preached. You talk to anybody on those teams and the camaraderie and how close we were and that had a lot to do with winning games, but we really cared about each other off the field. We cared about each other’s families and our kids and our kids grew up together. “Even today it’s kind of like the same. That’s one thing that really sticks out with me with all those guys. You have your friends and you have people you know, but you went to war with those guys every single Sunday. You knew them as people, not just as football players and you can’t really fathom what that means. Bills 2014 Hall of Fame class inductee Andre Reed has been working on his speech for tonight’s enshrinement ceremonies. With a little bit of help Reed is confident the message he wants to convey will be effectively delivered. “I feel really good about it,” said Reed. “I had Vic Carucci help me and he was a long time Buffalo guy with the (Buffalo) News and then he went to NFL.com and now he’s with the Browns writing for the Browns. What a perfect guy to help me out with these last five months of getting all my thoughts together and we’re dotting every ‘I’ and crossing every ‘T’. It’s going to be very nice. Very emotional at one point, but what he’s doing for me is have it flow very smoothly. The Bills newest Hall of Famer Andre Reed will be anything but alone on Hall of Fame weekend. While most are expecting most of his hometown Allentown, Pennsylvania to be on hand in addition to his family and close friends, Reed is expecting there will be a good number of Buffalonians taking over Canton, Ohio. You don’t need to ask a biased Bills fan. Anyone who remembers watching the early 1990’s Bills who won four straight AFC titles understands that documenting the history of that team must include Andre Reed. But as big a part as the now six Hall of Famers from that team counting James Lofton and head coach Marv Levy with Kelly, Smith, Thomas and Reed, played in those magical AFC title runs, Reed astutely points out that without their other teammates their success wouldn’t have lasted so long. “I just went out and played football. That’s what I did. I didn’t think I was better than anybody else, I just did my job the best I could to help the team win. 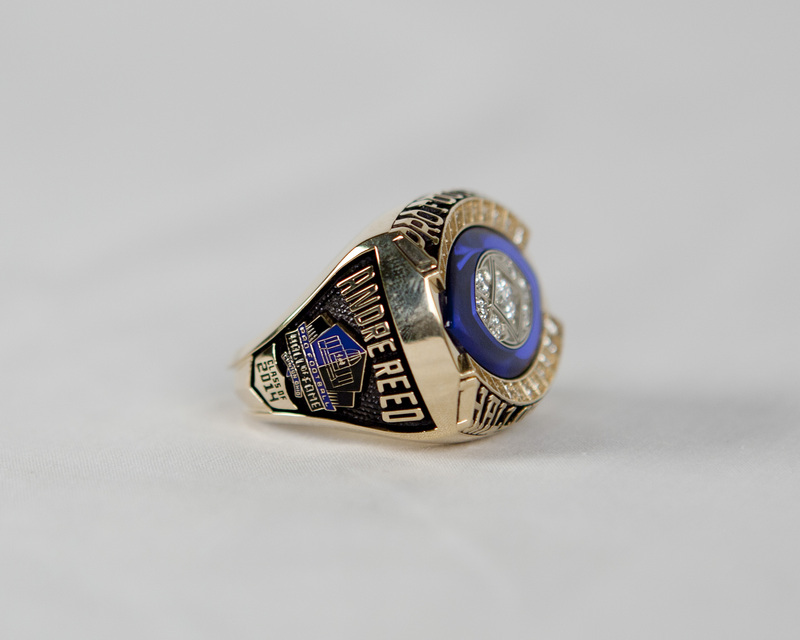 It just so happened that I played with four or five other Hall of Famers that thought the same way I did,” Reed said. “Our success on the field was probably all predicated that you’ve got your four or five guys who were perennial Pro Bowlers, but you have the guys that are backups who are just as good if not sometime during the year just like you. We had those kinds of guys on the team. Since he was selected as a member of the 2014 Pro Football Hall of Fame class Andre Reed’s schedule has been beyond busy. He hasn’t been home much and been to a countless number of banquets, but the Bills all-time leading receiver is trying hard to take it all in. With the logjam broken at the wide receiver position for the Hall of Fame with Cris Carter going in last year, it was thought that Andre Reed had the inside track on Tim Brown to gain enshrinement first. What some outside the Committee of Selectors forgot about was that Marvin Harrison was also a finalist. As USA Today’s Jarrett Bell pointed out to Buffalobills.com, Harrison, the second-leading receiver in NFL history was getting major consideration as a finalist. That’s why Bell thinks it’s good that Reed is going in this year to help clear the way for Brown before the more prolific stat receivers start making the list like Harrison. 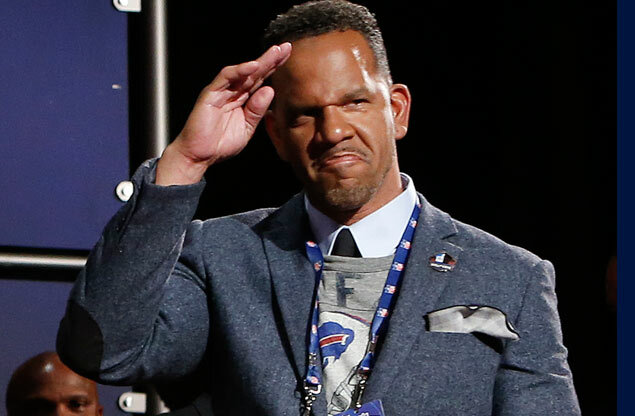 Bills 2014 Pro Football Hall of Fame inductee Andre Reed won’t be speaking early among the group of seven former players chosen for enshrinement on Saturday night. In fact Reed will be the penultimate speaker to accept induction at Fawcett Stadium. That according to the Pro Football Hall of Fame. Here’s the order in which the inductees will accept their enshrinement. ESPN’s Sal Paolantonio, an at large Hall of Fame Selector looked favorably on Andre Reed’s candidacy, but knew his enshrinement would never be possible without a break in the logjam of wide receivers. As we covered in our story from inside the Selectors room there was a determined effort to break the stalemate at receiver between Tim Brown, Cris Carter and Andre Reed in 2013. Ultimately what sold Paolantonio was his belief that the epitath for those Bills teams had to include Reed’s name. “You can’t write the history of the NFL without the core four of the Buffalo Bills, Jim Kelly, Bruce Smith, Thurman Thomas and Andre Reed,” he said.